It’s the topic that no RVer enjoys. However, waste containment and odor control are necessary aspects of RVing. FMCA and the “RV Doctor” Gary Bunzer present RV Waste Management 101. Your RV’s waste plumbing is made of two components: the gray system (liquid waste) and the black system (solid waste). Gray tanks can be outfitted with a drain opening as small as 1-1/2-inch. Black tanks are required to have a 3-inch outlet. As many RVers know, any accumulation of waste within these drain openings or the holding tank system can lead to odors. The first line of defense against invading fumes is the water lock, which is established by P-traps located below the sinks and tub/shower drains. Long a staple in the plumbing industry, the common P-trap works well in residential homes. 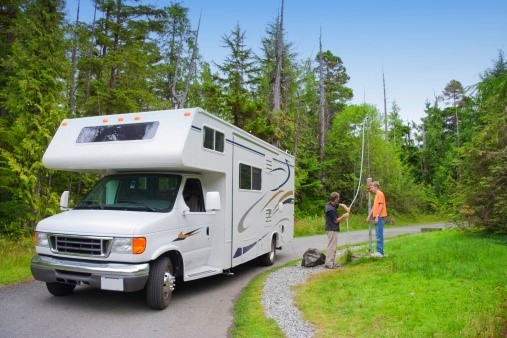 However, because of the seasonal nature of RVing, P-traps in RVs typically are used less frequently, which can result in the P-trap’s water seal becoming diminished. The jostling that occurs while traveling; improper siphoning action during highway turns and tank evacuations; or simply drying out from non-use can render the water seal ineffective at blocking odors. In addition, the P-trap requires diligent maintenance, including frequent cleanings and freeze protection. If neglected, waste residue inside the trap can foster bacteria growth and subsequent odors. However, there is an alternative to the common P-trap: the HepvO waterless sanitary valve. Available in the aftermarket and now found on many RVs right from the factory, the HepvO waterless valve replaces the P-trap, creating an effective seal against odors. This sanitary valve is constructed with a self-sealing, flexible, silicone membrane that allows water to flow through it but completely closes off when water flow stops. Therefore, holding tank odors are prevented from migrating up and through the sinks, tub, or shower. As for the toilet, keep water in the bowl at all times, though that may be challenging when the RV is stored. Still, with water in the bowl, you are guaranteed that no holding tank odors can escape into the RV’s living area. If your RV’s toilet will not hold water, chances are it is time to replace the internal seals and gaskets. You’d be surprised to see just how many seals are used in an RV toilet! Dry toilet seals are the main sources of black tank odors. Most toilet manufacturers offer gasket repair kits. Most likely, this type of maintenance will be necessary at some point during your RVing career. Venting is required for both the black and the gray systems. How do RV manufacturers accomplish this? The common method is to run a length of thermoplastic ABS pipe from the holding tank up and through the roof of the RV. The importance of proper venting cannot be overstated, especially as it relates to odor control. Without correct venting, sinks will not drain properly; bacteria can propagate; and holding tanks will not drain as quickly or completely. Keep in mind, as a holding tank empties or a sink drains, fresh air must enter the drainage system. Since holding tanks rely solely on gravity for emptying, having air enter the system as sinks and tanks are drained results in a faster and more thorough process. To accomplish proper air flow, there are two types of vents used in RV waste systems: direct exterior vents and anti-siphon trap vent devices. Sometimes RV manufacturers cut a large hole in the ceiling and roof during installation of the vertical vent pipe. Oftentimes, this opening is not sealed properly around the outside perimeter of the pipe. In other instances, the vent pipe itself may not extend far enough above the roofline; the industry rule is that the vent pipe must extend at least 2 inches above the roof. If the vent pipe is not sealed properly, tank odors can pass up the direct exterior vent; collide with the underside of the sewer vent cap; be forced back down the sides of the vent pipe; travel into the ceiling area; and then migrate to the living area. To ensure this doesn’t happen in your rig, remove the sewer vent(s) on the roof and ensure the space around the vent pipe is sealed tightly. Also make sure that the pipe itself stands at least two inches above the roof. If necessary, extend the vent by using a common ABS coupling and a short piece of pipe. In addition, depending on how the vent is attached to the top of the holding tank, vent pipes have been known to fall down inside the tank below the surface of the waste, nullifying any venting action and allowing odors to exit the tank. By inspecting the vent termination on the roof regularly, this can be avoided. The second type of vent is the anti-siphon trap vent device (ASTVD), nicknamed “check vents.” These are used as secondary vents to aid in draining sink fixtures. They allow air into the drainage system but prohibit air from passing out of the system. ASTVDs are installed in the liquid drain piping system at or near a P-trap inside a cabinet. Look under your RV’s kitchen and bathroom sink areas to find them. They are mounted at least 6 inches above the P-trap’s horizontal arm. ASTVDs do not allow odors to escape into the living portion of the RV, thanks to a pressure-controlled, rubberized, one-way valve. In other words: air in but not out. The rubber membrane employed in ASTVDs can sometimes dry out and become stuck in the open position. If holding tank odors are prominent under a galley or bathroom cabinet near the P-trap, chances are it is time to lubricate the rubber seal inside the ASTVD. Use lubricant to moisten the rubber diaphragm. Since it is located above the actual flow of waste water, the ASTVD is simply threaded into a fitting above the trap arm and can be easily removed for periodic maintenance. Enzyme-based, bacteria-infused blends have proven to be the most effective type of tank additive. These blends actually digest the odor-causing molecules at the source inside the waste tanks, thereby eliminating odors rather than masking them. Some holding tank treatments may consist of harmful chemicals such as formaldehydes. Try to avoid these if possible. The issue of chemical products has prompted many state parks, campgrounds, dump stations, and local municipalities to ban the evacuation of RV holding tanks if such chemicals are used. Remember that, to a certain extent, RV holding tanks are living, thriving environments. Anti-bacterial soaps, detergents, or DIY treatments can destroy the “good bugs” that are beneficial in helping the elimination of odors. Most RVs today feature some visual method to help owners determine the fluid levels in the holding tanks. This is normally accomplished with “through the wall” monitoring sensors attached to the tanks. Others use externally applied, electronic sensors. It’s those “through the wall” sensors that can be aggravating for RVers. False or inaccurate monitor panel indications caused by tank sludge and debris stuck on the sensor probes are far too common. The easiest way to avoid black tank blockages is to use copious amounts of fresh water during each flushing of solid waste. Always be sure to cover the very bottom of each holding tank with fresh water after each evacuation. Do not store the RV for lengthy periods with contents still in the tank. Being proactive when it comes to your RV’s waste system will reap its rewards for you and also protect the environment. If anything, it will ease offensive smells! A happy holding tank is a healthy holding tank. And, remember, when working on your RV’s waste plumbing system, even when simply “dumping” the holding tanks, take safety precautions. Wear disposable gloves when handling sewer hoses and connections. And when using hand tools while working on these systems, be sure to clean and disinfect them after each use.